In their new article Bechtel et al. examine the effect of sanctioned compulsory voting on the outcomes of direct-democratic decision-making in Switzerland. Former research has shown that public policy benefits voters over nonvoters and that turnout is considerably lower within the group of citizens with low income. The authors argue that sanctioned compulsory voting should reduce this systematic inequality of representation by especially mobilizing voters with low income as they face the highest relative costs for nonvoting. This, in turn, should increase the support for leftist policies, i.e. policies that benefit especially these parts of society. To test their theoretical argument, Bechtel et al., on the one hand, analyze federal referendums in the Swiss canton Vaud within the period from 1925 to 1948 as compulsory voting existed in Vaud during these years. On the other hand, to test the generalizability of their findings, they run correlational analyses of the relationship between compulsory voting and the support for leftist policy proposals in referendums in all Swiss cantons between 1908 and 1970. The findings of the empirical analyses confirm the hypothesized effect: The introduction of sanctioned compulsory voting lead to an increase of turnout by nearly 30%, a turnout rate close to universal and, as expected, strongly increased the support for leftist policies proposals. The article provides new insights into the effects of electoral institutions on public policy with unique data, convincing empirical evidence and sophisticated methods. Especially, the authors make use of a creative design to estimate the causal effect of compulsory voting on support for leftist or rightist policy proposals by imputing a baseline, i.e. outcomes of federal referendums without compulsory voting. However, it is debatable to what extent the ascertained effect still exists today. The traditional cleavage between labor and capital interest and the respective party alignments have decreased in recent decades and many voters with low income have turned to other parties than social democratic ones. Furthermore, the study compellingly illustrates the effect of compulsory voting on the support for leftist policies in Swiss referendums but it remains unsettled whether this holds for countries with compulsory voting in legislative elections as well. These countries, Australia for instance, rather seem to act as counterexamples. Córdova, A. and G. Rangel (2016): "Addressing the Gender Gap: The Effect of Compulsory Voting on Women’s Electoral Engagement", Comparative Political Studies. Online First: 20. June 2016. doi: 0.1177/0010414016655537. Currently 22 countries worldwide practice compulsory voting – a mechanism highly efficient in reaching close to full participation rates. Córdova and Randel (2016) are interested in the impact of this twist in electoral rules on the gender gap in turnout on the one hand and political involvement on the other hand. Given that we know from previous research that in voluntary voting countries women tend to vote less and are less informed than men (see e.g. Verba et al. 1995), the authors ask whether these gender gaps continue to exist under compulsory voting. For that purpose, survey data from up to 44 democracies between 1996 and 2011 is analyzed with regards to (1) self-reported turnout and (2) various indicators for the perceived level of political information (hence how well respondents think they know about politics). The findings clarify that compulsory voting indeed succeeds in closings the gender gap in voting, and at least reduces differences in (subjective) political knowledge between men and women. The authors argue that two mechanisms account for this effect: to start with, the opportunities for women to receive relevant information increase, because party campaigns target all voters with the aim of maximizing their vote share if voting is compulsory. Moreover, the price of potential sanctions for non-voting sets also incentives to actively seek additional information in order to ensure that participating in the election is worth the effort. The authors provide strong evidence that compulsory voting bears the potential to increase women’s representation through better turnout, but I wonder whether women’s vote choice is really based on grounded information. Would the findings remain the same if objective indicators for political knowledge were applied? If the complex psychological mechanism suggested by Córdova and Randel (2016) is correct, women try to make qualified vote choices and are willing to invest resources to gather information, which should increase their actual political knowledge. However, the operationalization in the article measures perceived involvement only, but does not capture whether the actual knowledge increases. Voters might just believe to be better informed to rationalize the effort of casting a ballot to themselves and others. Voters in compulsory voting systems, which would not have voted under voluntary voting (a group in which women are strongly overrepresented) would thus remain at a lower level of objective political knowledge and may not make the optimal vote choice, which renders the positive effect of equal turnout meaningless. Verba, S., K. L. Schlozman, H. E. Brady, and H. E. Brady. 1995. Voice and equality: Civic voluntarism in American politics. Vol. 4: Cambridge Univ Press. This article sheds light on the effects of electoral reforms from closed to open list systems on the relative success of parties with different levels of internal disagreement on salient issues. Building on previous findings, Blumenau et al. (2016) propose two reasons why parties with internal disagreement should benefit from open-list elections compared to closed-list elections for two reasons. First, the electorate might find a candidate in a diverse party more attractive than the party itself and would hence vote for that candidate under open-lists, but for another party under closed lists. Secondly, under open-list systems, voters might take stance in intra-party dispute by aiming to advantage one candidate to defeat another co-partisan rival but would vote for another party in closed lists. Drawing on an experimental research design of a hypothetical European Parliament election in the UK, this study shows that an open-list ballot system would benefit Eurosceptic candidates of the Conservative Party at the expenses of the Eurosceptic party UKIP. Hence, these findings suggest that niche parties that mobilize on single issues are likely to lose support when electoral rules shift from closed to open-list systems. Voters tend to vote for unified parties in closed list systems while they might be attracted to specific candidates in internally divided parties under open lists. With their well-developed experimental research design, Blumenau et al. (2016) methodologically contributes to existing literature which mostly draw on observational data to analyze effects of open-list systems. However, while provide evidence for their assumption that the effect of ballot type is contingent on intra-party disagreement, they do not address the question of how candidate ranking on the ballot paper or other characteristics of candidates (e.g. age, gender) affect voters’ choice in combination with inter-party dispute. 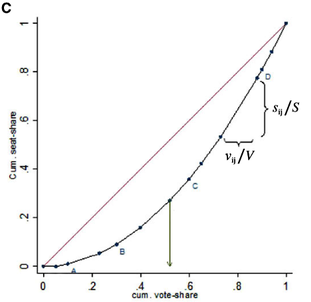 To further advance our knowledge on the consequences of open-list systems, future research should analyze how the effects observed under this experimental setting translates into practice when electoral systems change indeed and voters do not receive explicit information on candidates’ position on a certain issue. In such a setting, voters might face a more complicated decision-making process as information might be more imprecise and policy preferences of candidates more vague. Empirical research on electoral institutions and the welfare state regularly showed that democracies with proportional electoral systems spend significantly more on redistributive policies than democracies with majoritarian electoral systems. Theoretically, three main strands of research evolved around this phenomenon, each proposing different explanatory factors. The first approach acts on the assumption that in majoritarian systems parties have a higher incentive to engage for a district-based targeting of goods compared to geographically broad-based welfare policies. The second approach identifies the number of parliamentary parties as the underlying mechanism accounting for differences in welfare spending between proportional and majoritarian systems due to its influence on party platforms. The third approach finally presumes that there is less income-based voting in majoritarian systems because of salient cleavages in other policy areas. However, previous studies tested these approaches empirically only on the basis of macro-level data, leaving the micro-level aside. Helgason’s article contributes to the literature in this field of research by scrutinizing these theories using micro-level data from the “Comparative Study of Electoral Systems” (CSES), covering 99 lower house elections in 41 countries from 1996 to 2013. Furthermore, the study provides a new measure of income-based voting, expressing the predicted changes of an individual’s vote choice under income alterations for each election which is also comparable across countries. Applying a second stage model, Helgason closely follows the modelling strategy developed by Duch & Stevenson (2008) but adjusts and refines it at several points. On the whole, the article finds support for the proposition that more proportional electoral systems lead to more income-based voting. However, the results do not show significant differences in the voting behavior of middle-income voters between proportional and majoritarian electoral systems. According to this, differing party platforms do not seem to explain differences in welfare policies between proportional and majoritarian electoral systems. For the assumption that in majoritarian systems different salient cleavages weaken the role of income-based voting the study provides no robust support either. Due to limited data availability, the covered period of time is relatively short and it is left open how the model can cope with major electoral reforms, an issue that especially could be meaningful for mixed electoral systems. But the applied modeling procedure is definitely an exciting approach which is also robust to several alternative specifications and it is therefore surely a promising course of action for future research in this field. Duch, R.M. and R.T. Stevenson (2008) “The Economic Vote: How Political and Economic Institutions Condition Election Results”, Cambridge: Cambridge University Press. Nunez, Lidia and K. T. E. Jacobs (2016): "Catalysts and barriers: Explaining electoral reform in Western Europe", European Journal of Political Research, Online First, doi: 10.1111/1475-6765.12138. In their article, Nunez and Jacobs provide a novel account on the question of why electoral system changes occur, arguing that in order to explain electoral reforms, it is not sufficient to only focus on catalysts that increase the likelihood of reform. On the contrary, procedural barriers are at least as important to explain why electoral reforms do not happen even if desired and beneficial. Their investigation is driven by the puzzle that electoral reforms occur so rarely despite frequent debates about their importance. In order to solve the small n problem, the authors do not only focus on wholesale replacements of electoral formulas, but lower the threshold to include all reforms that potentially affect the proportionality of an electoral system. Their analysis is based on a statistical evaluation of 16 West European countries from 1975 to 2005, covering 23 reforms of the proportionality of electoral systems, which shows that procedural barriers, operationalized as constitutional rigidity and judicial reform, matter more for electoral reforms than (most of) the catalysts. While constitutional rigidity and partial alternation (governments consisting of incumbents and non-incumbents) reduce the likelihood of reform, judicial review, as opposed to the authors’ expectation, seems to have a positive effect on electoral system change since constitutional courts can legitimize reforms or demand a reform of the electoral law. The article is structured by a clear and convincing argumentation, providing novel insights on the role of procedural barriers for electoral reform. However, the paper does not offer explanation on how exactly the three significant variables, constitutional rigidity, partial alternation and judicial review, contribute to changes in electoral systems. The statistical analysis provides correlational results, but to make their argument stronger, it would be interesting if the authors explored the causal relationship in more detail. While the effect of all three variables on electoral reform is rather small, the analysis opens up new opportunities for further research. In particular, investigation of the role of courts in triggering reform seems to be a promising avenue. Moreover, it would be interesting to oppose the chosen independent variables to other variables, which are believed to explain electoral system changes. All in all, the article provides a strong argument for why researchers should not only focus on drivers, but also on barriers to explain electoral reform. A bulk of research compares the left-right position or policy preferences of citizens and governments, identifies the degree of congruency created through proportional and majoritarian electoral systems and evaluates the quality of different electoral systems based on this information. Blais, Guntermann and Bodet (2016) contribute to this debate by introducing a new dimension of congruency: between citizens’ party preferences and the governments’ party composition. In contrast to left-right and policy preferences, party preferences are more instable and fluctuating, because they are influenced by the support for party leaders, the evaluation of a parties’ performance in parliament and scandals surrounding a party. For this reason, this aspect of citizens’ preferences is also more likely to explain change in government. The authors compare the performance of PR and MV with regard to this new congruency measure using CSES data for 87 elections in 35 countries. They find that proportional electoral systems are more likely to bring the first party preference of many citizens into government. In contrast, majoritarian electoral systems succeed in bringing the party with the highest average rating by citizens’ into power (hence the most popular party in absolute terms) as well as having the most positive rating of the overall government (relative to the opposition). Even though this new approach to citizen-government congruency is highly appealing and plausible, the paper in my opinion lacks a discussion of the endogeneity of party preferences to the party system (which is strongly correlated to the electoral system). We know that psychological and strategic considerations influence voters when casting a ballot. In a similar manner, the likelihood that parties win seats in a given electoral system will most likely influence survey response about party preferences. In a MV system, voters are more likely to name parties as their first preference, which have realistic chances to win mandates, hence one of the two major parties. No wonder, the most popular party of most citizens is in power. In a PR system, however, voters might as well express preferences for many diverse minor parties, thereby reducing the overall support for the most popular party. What does explain why some voters support the change of electoral rules and others do not, when they have the chance to vote on the decision in a referendum? To answer this question, Jou elaborates on a series of causes for voter’s preferences. Utilizing individual level data on two such referenda which took place in the United Kingdom and New Zealand in 2011, Jou advances previously established empirical results by introducing a comparative perspective to the question. His findings show that preferences for electoral reform and for retaining the status-quo respectively were mainly driven by partisanship (small vs. large party; center-right vs. center-left), satisfaction with democracy, winner/looser status, and cabinet type preference. Most interestingly, ideological values seemed to affect preferences for an electoral system independent from the instrumental incentive. This was highlighted by the finding that voters on the right were more in favor of plurality compared to voters on the left after controlling for their identification with small and large parties respectively. This certainly comes as the most surprising finding. As Jou concludes, preferences for electoral systems are “at least partially the result of long-term beliefs” rather than the exclusive result of short-term calculations. Expanding these findings, future research may draw on Jou’s work to also elaborate on contextual factors. Although the author included the individual winner/looser status based on previous election results, this approach might neglect that parties can win by constituency vote shares ranging from as low as 29% to 72% (as in the 2010 British National Election). Assuming that voters feel differently about changing the electoral system when their party loses by 5% compared to when it loses by 30%, further studies could include party competition as a factor that moderates the effect of the winning/loosing status. Is electoral quality superior under proportional representation (PR) than under plurality voting systems? Lehoucq and Kolev examine this question by claiming that electoral fraud and misconduct are more likely under single-member plurality districts (SMD) and first-past-the-post (FPTP) systems. As single votes are more important for electoral success under plurality system due to their ‘winner-takes-it-all’-nature, incentives to engage in electoral malpractice or to denounce behavior of partisan rivals should increase. On the contrary, while parties may lose a seat by the margin of one vote, multi-member PR systems are unlikely to deprive parties of legislative representation the way plurality systems can do. In their paper, the authors test this hypothesis by drawing on two complementary datasets: one subnational database of accusation of national fraud in Costa Rica between 1901-1948 and one cross-national of more than 710 elections in 170 countries between 1975 and 2004. In their analyses, Lehoucq and Kolev show that PR is associated with less controversies and accusations of fraud than plurality systems. Beyond, they find that social context matters: regardless of the nature of the institution, highly divided societies are more prone to hold low-quality elections. However, even in the context of societal polarization, PR systems improve the quality of elections. This paper advances our understanding of how electoral laws affect electoral malpractice and thus influence a fundamental component of political competition. To further enhance our knowledge in this field, the authors’ argument could actually be further advanced: if it is the decisiveness of single votes that drives electoral malpractice, then we would also expect that the closeness of race also affects the incentives to report or engage in malpractice. Following the line of argumentation put forward by the authors, it could be assumed that the more competitive the election, the more is at stake and thus, the worse the quality of an election. Previous work on party polarisation often considered income inequality as the main cause of polarisation. However, while empirically in some countries income inequality and party polarisation are strongly related, in other countries a close correlation is not observable. The article by Han contributes to this field of research by arguing that the electoral system acts as an intervening variable either facilitating or hindering parties to take more divergent positions on redistributive policies when income inequality rises. Based on data that covers 24 advanced democracies over a period of time from 1960 to 2011, the study finds that under permissive electoral systems increasing income inequality leads to a rise of party polarisation. Furthermore, the analysis provides evidence that there is no positive effect of rising income inequality on party polarisation in restrictive electoral systems. This difference between electoral system types is due to the unsureness of parties in restrictive electoral systems whether taking more extreme positions will result in more votes. Gaining the support of the median voter is more crucial in restrictive systems compared to permissive systems. Interestingly, the study finds no strong statistical relation between party polarisation and the factors of income inequality and the electoral system themselves without their interaction. Additionally, Han presents an interesting argument for why a general effect of increasing income inequality on party polarisation does not exist, showing that the role of electoral systems and, ensuing, strategic concerns of political parties need to be taken into account. The time-series cross-sectional model is well-specified, including a broad set of control variables. Additionally, the author provides several robustness checks, also comparing different measures of the dependent variable. While the study clearly indicates that when income inequality increases, under permissive electoral systems, parties overall tend to take more extreme positions to target their core supporters, i.e. the “poor” (left parties) and the “rich” (right parties). This raises the question of possible differences in that effect on parties’ ideological positioning (and their causes) for left as well as right parties between different countries. Hence, this is a phenomenon that awaits further investigation. This article by Put and Maddens advances our understanding of which candidates are able to build personal reputation based on local ties and to what extent this personal relations secure (re)election in flexible-list systems. Although counter-intuitive at a first glance, the authors forward the argumentation that candidates from larger municipalities have structural advantages: They should profit from larger networks not only in terms of electorate but also considering party grassroots volunteers. Hence, candidates that hold local office in large municipalities should more likely receive preferential votes than similar candidates in small municipalities. Drawing on data of more than 5500 candidatures on 179 different party lists in Belgium between 2003 and 2010, Put and Maddens scrutinize the interrelation of local political office and the size of the municipality the candidate holds office in. Their multilevel analysis supports the idea that the positive effect of political office at the local level interacts with the relative size of the municipality in the district. More explicitly, the larger the municipality, the stronger the effect of local office on the number of preferential votes at the aggregate level. This research contributes to the growing literature on central personal vote-earning attributes (PVEA) by its innovative operationalization of local ties of on the basis of the candidate’s political function in the municipality rather than on local birthplace. I would be interested to see whether the argument of the paper holds when including the Belgium electoral system change into the analysis. With the increase in district magnitude in 2002 and the decreased relative weight of votes in 2000, the percentage of preferential cast should have augmented. Has this also affected the PVEA as operationalized by this paper? And, are the consequences of these electoral law changes constant over time or do they come into play only after a certain number of elections? Orit, K., L. Harsgor, and R. A. Sheinerman. (2015): "Are Voters Equal under Proportional Representation? ", American Journal of Political Science forthcoming, doi: 10.1111/ajps.12225. Orit, Harsgor and Sheinerman move research on vote-seat disproportionality to the district level by applying the logic of the Lorenz curve of income inequality and the Gini inequality index. While previous studies rely on macro level measures such as the disproportionality index, the authors systematically analyze the vote-seat discrepancy for each party in every district. They map the average vote and seat share graphically and contrast it to perfect representation (the seat share exactly matches the vote share). The area between the two curves predicts the Representational Inequality Index, with more space suggesting stronger inequality in voters’ representation. Applying this method empirically with data from twenty Western democracies, the authors find that voters casting their ballot in smaller districts are less likely to make a difference on seat distribution and are therefore underrepresented. This disproportionality at the district level translates into an unequal representation of parties along ideological cleavages: Right-wing parties tend to be overrepresented if the Representational Inequality Index is high, because they are usually stronger in more rural areas, which tend to have smaller districts. Thus, they have a competitive advantage in rural areas caused by district magnitude, while winning a proportional vote share in the larger urban districts. This research improves our understanding of how electoral rules operate at the district level and clarifies how varying district size causes unequal representation of voters within a country. However, there might be a trade-off between ideology- and region-based interests of voters that this model cannot capture. District magnitude does not only foster vote-seat proportionality, but is also a political tool to incorporate regional interests. To ensure a fair say in parliamentary debate, many countries decide to assign a larger proportion of seats to regions with strong geographical interests than they have voters (A good example might be the Faroe Island in Denmark, which have a district magnitude of two). Applying the argument of the authors in this context means: While right-wing voters might be better represented than voters supporting parties at the opposite side of the ideological spectrum in the same district, they are all on average still overrepresented. This leads to the question how voter-seat disproportionality could be incorporated into this model of vote-seat discrepancy. Bol, D., J.-B. Pilet and P. Riera. (2015): "The international diffusion of electoral systems: The spread of mechanisms tempering proportional representation across Europe", European Journal of Political Research 54 (2), 384-410. doi: 10.1111/1475-6765.12091. In their article the authors fill a gap in the literature on electoral systems by showing that a country’s choice of an electoral system does not occur in a vacuum but is influenced by the electoral system choice of its peer countries. The paper focuses on two mechanisms employed by many European countries after 1945 to limit party system fragmentation in systems of proportional representation (PR): low district magnitudes and high electoral thresholds. Bol et al. carry out longitudinal analyses of the adoption of these two mechanisms based on electoral system data from 27 countries including a total of more than 300 elections. Their empirical analyses indicate the existence of electoral system diffusion between peer countries: The likelihood that a country adopts low district magnitudes or high electoral thresholds significantly increases with the number of peer countries that adopted similar measures within the last two or three years. Generally, the article adds an innovation to the literature on electoral systems by casting light on the impact of international factors on electoral reform. Furthermore, to prove the robustness of the observed effects, the authors provide a large number of specifications of their quantitative model and even corroborate their findings by additionally considering qualitative insights on electoral system choice derived from several case studies and the analysis of parliamentary debates. However, the findings of this study could be further substantiated by a more comprehensive theoretical basis of the phenomenon of institutional diffusion itself. Moreover, the question of the exact mechanism that explains the diffusion of electoral system choice is left open for future research. Thus, an integrative model explaining the motivation of national legislators to adopt reforms tempering the effects of PR could include domestic factors as well as those international factors presented in this paper. In their article, Bernauer et al. examine whether certain societal groups are ideologically under-represented in Western Democracies and, beyond, whether electoral rules systematically moderate levels of under-representation. Approaching this topic of ideological congruence from a party-centered perspective, their analysis of survey data from 24 parliamentary democracies indicates that bias exists against those with low income and to a smaller extent against women. Thereby, Bernauer et al. provide evidence that the institutional design plays a crucial role in achieving more equal ideological representation of minorities. The proportionality of the electoral system moderates the degree of under-representation – larger district magnitudes reduce the gap between the poor and the rich. As the authors focus on preferences of traditionally disadvantaged groups, instead of median voters, the study goes beyond the general question of whether electoral rules enhance congruence between citizens and political actors. Thus, it sheds light on the less studied field of the impact of the institutional setting on the ideological representation of subgroups. To further examine the unequal responsiveness in substantive terms and the effects of electoral rules therein, it would be interesting to focus on sub-constituencies’ preferences for a variety of policy issues and compare it to the direction of policy output. Differentiating between policy preferences and thus disentangling the general left-right dimension of the political conflict might reveal new insights, especially concerning unequal responsiveness to issues that are not strictly embedded in the left-right cleavage (e.g. environmental issues). In particular, women’s preferences might differ strongly on policies rather than on issues reflected by the left-right dimension. In this context, several studies have e.g. shown that women tend to have higher levels of environmental concern than their male counterparts (e.g. Biel and Nilsson 2005). Hence, future research in the field of substantive representation could contribute by including policy congruence in the equation instead of focusing on the left-right dimension of political conflict. Biel A. and A. Nilsson (2005): Religions Values and Environmental Concern: Harmony and Detachment Social Science Quarterly 86, 178–191. The article by Andrew Eggers deals with the finding of many previous studies that turnout is higher in elections with proportional representation (PR) compared to plurality what concerns the electoral system. However, the mechanisms behind this effect are still debated. It is difficult to unravel these mechanisms because PR and plurality systems differ in several ways (e.g. district magnitude, party system size, ballot structure). To answer the question of how and why PR increases turnout and to cope with the associated problems, the author uses data from municipal elections in France. For French municipalities with 3.500 or more inhabitants electoral law specifies a PR system for municipal council elections and a plurality system for municipalities with smaller population. These data allow analyzing the effect of the electoral system while holding constant many other relevant factors. Eggers applies a regression discontinuity design to measure the effect of the electoral formula on turnout for a sample of French municipalities near to the threshold of 3.500 inhabitants. As a central finding the analyses show that PR indeed increases turnout in comparison to plurality rule (at least by about 1% in French municipal elections, what proves to be a robust effect). The study identifies two mechanisms of how PR increases turnout. On the one hand, a proportional system encourages turnout in races with relatively low competition. On the other hand, it induces the entry of new candidates, respectively increases the number of competing lists. So, the paper sheds light on the crucial role of proportionality in explaining cross-national differences in turnout. However, its findings must also be treated with care what concerns their generalizability and their application on other levels. Therefore, further research must be done in that direction. This study constitutes a suitable and extraordinary starting point. Matthew Singer provides strong evidence for a causal effect of district magnitude on party fragmentation for the case of the Spanish Congress of Deputies, thereby enriching the debate about the endogenous relationship between electoral rules and party systems. The author introduces a new strategy for providing empirical evidence for Duverger’s hypothesis arguing that changes in district magnitude, the explanatory variable, are exogenously determined as they follow exclusively from population shifts. Drawing on several operationalization of party fragmentation, the article is able to analyze the mechanical and psychological effects separately. The findings suggest that voters behave strategically, choosing to vote more frequently for small parties once the district magnitude increases. Yet, parties and candidates do not respond to the larger incentive to run for office due to increasing district magnitude. This calls our attention to the fact that the psychological effect indeed refers to two groups of actors which have to be distinguished carefully – voters and parties! I would be interested to know whether the effects remain constant if the heterogeneity of the electorate is included in the model. Those districts that gained new seats to represent a growing number of voters might be characterized by a more diverse electorate, as new voters import their identity in terms of e.g. regional belonging (or no regional belonging) to their new districts. Singer shows that a growing number of voters in a district per se does not influence party fragmentation by controlling for the number of registered voters (p. 123), but also argues that some districts with strong ethnic and regional parties tend to have a higher party fragmentation (p.121). Thus, might the increasing party fragmentation in districts which received new seats due to rising electorates follow in truth from diversity which grows at the same token? Guido Tiemann contributes to the comparative analysis of electoral system effects by shifting the perspective to the district-level. Adding to the current debate about the importance of the context in which institutions operate, Tiemann scrutinizes contextual variations in the links of district magnitude and the number of viable candidates. Thereby, he distinguishes between demand for viable candidates, as determined by social division lines, and supply of political parties, conditioned by the permissiveness of the electoral system. Analyzing data from 17 West European countries, Tiemann provides evidence that the district magnitude affects the number of viable candidates in heterogeneous societies stronger than in homogenous countries. In the latter, electoral fragmentation tends to remain below the carrying capacity established by the electoral rules. Moreover, the effects of district magnitude are weakened by the provision of upper tiers at the election level. In fact, the findings suggest that the greater the share of seats allocated to higher districts, the minor the marginal effect of district magnitude on the number of viable electoral candidates. This study shows that previous findings on the national level are also valid for electoral data on the district level. The original data allows for testing of the M+1 rule proposed by Cox (1997) at the district level – where it is actually supposed to operate. In this context, it would be interesting to find out whether the results remain similar when indicators of societal cleavages at the district level are included, as this study measured social heterogeneity at the national level. It could be argued that larger districts, e.g. in cities, might be more heterogeneous in terms of economic background or values than smaller districts on the countryside. Wolfgang Wagner uses the natural experiment provided by the Macedonian (1) electoral system reforms to test for the impact of distinct electoral systems on descriptive representation of the Albanian minority. Macedonia undertook two major electoral reforms since its independence, changing from the majoritarian two-round system applied in the 1990 and 1994 elections to a mixed member proportional system in 1998, and immediately afterwards to a proportional system. The figures presented by Wagner show that the gap between the proportion of the Albanian population and ethnic MPs was smallest in the 1990 election which was conducted under the majoritarian electoral system (-2.24%-points), and largest in the 2011 election under PR (-7.97%-points). In this manner, the findings challenge the widespread opinion that these reforms increased descriptive representation of the Albanian minority, thus the share of group members in legislature. Due to the fact that the Albanians live mostly in the North East of the country, they managed to hold the majority in several single member districts, which allowed for their representation under MV. While the finding that regionally concentrated minorities manage to win mandates in majoritarian electoral systems does surprise nobody, Wagner‘s study bears the potential to challenge the popular argument that PR always leads to descriptive representation of ethnic minorities. The most interesting follow-up question is certainly, why the proportional system does not create proportionality between voters and MPs. This seems particularly surprising because the Macedonian system allows for a high degree of vote-seat proportionality as it prescribes no electoral threshold. One explanation might be that ethnic cleavages slowly lose their political relevance, motivating members of the minority to vote for other than ethnic kin parties. Within a group which is rather heterogeneous, as an increasing number of Albanian parties and a changing party system suggest, more and more citizens might chose to vote across ethnic cleavages as well. (1) Macedonia refers to the Federal Republic of Macedonia.